Need a great pet bed? You should think about trying a snuggler bed or pocket bed. As almost any pet owner can attest, snuggling is not strictly limited to people. Many creatures enjoy it. As a human, think of how great it feels curling up with a good book or settling in to watch a movie while snuggling up under a blanket all comfy-cozy. Besides the fact it feels yummy in a physical sense, there's something comforting about it. Whether you're snuggling with someone or snuggling solo, it's a truly divine sensation. Merchandisers have caught on to this and created a myriad of products with that feeling in mind for both humans and pets. Now you can not only get yourself Slankets and Snuggies, but you can get your fury family members pet bedding geared toward snuggling as well. Snugglers come in all shapes and sizes. Whether you have ferrets, dogs, cats, rabbits or even pot belly pigs, if you have a snuggler, there are some really creative pet beds out there now to choose from. Some of them are shaped like caves while others look like bags, pockets, envelopes and even soft-structured pet houses following a more traditional line. These new pet beds are perfect for snugglers that like to burrow, such as ferrets. They provide an instinctual atmosphere for them and might spare your couch and chair cushions or throw rugs, pillows and blankets from regularly being clawed, pawed and tossed willy-nilly in your pet's efforts to nest. 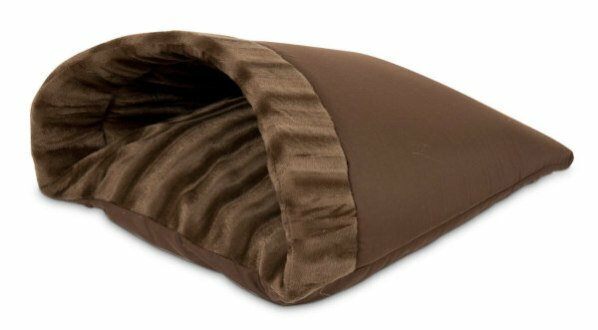 Similar to a sleeping bag, this relatively new pet bed called the Sleep Zone Cuddle Cave by Ethical Pets is gaining in popularity due to its loose-fit and lightweight design. It looks like it would allow for optimum burrowing, nesting and snuggling. The exterior is micro-suede and the interior is plushy fur. The whole thing can be thrown in the laundry. Part of the sales pitch in association with this product and seller is that their "assortment of styles, sizes and colors are designed to coordinate with a home’s decorative theme," so you've probably got a pretty good chance of finding one that blends with your belongings, if that's something that's important to you. The Snoozer Cozy Caves have some really nice features, as far as convenience, like removable inner and outer covers that are washer and dryer safe with heavy duty brass zippers. The whole bed is washable. The cave flap or hood has a rigid insert to help keep it open for dogs like dachshunds who like diving in deep. This brand is really well constructed and this particular design has received high scores with consumers with rave reviews about how their pets love it. 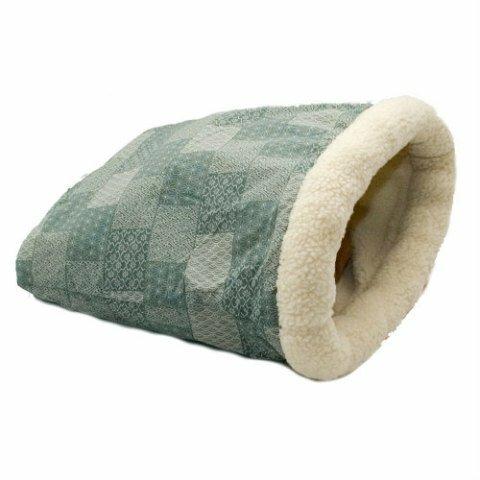 Cozy Cave pet nesting beds come in several sizes, colors and fabrics, and there's even an orthopedic model. You can also get replacement covers for them through the company if/when yours wears out. With extra deep sleep surfaces, the cave portions are lined with fleece and the bodies are made from poly/cotton mixes and micro-suedes. Snoozer is also the maker of a lot of other great pet beds and products like airline approved pet carriers, bike baskets, car seats, travel pads, covers, robes and more. The really nice thing about Milliard's pet caves is they come in a wide variety of styles for varying degrees of burrowing and burrowers. The Premium Plush Pet Cave is perfect for crates, dog houses and vehicles. Because of that, it ranks high for on-the-go use. It's pocket shaped and covered in deep plush with a thickly padded threshold bolster and completely machine washable. It's a good choice for nesters that travel a lot. 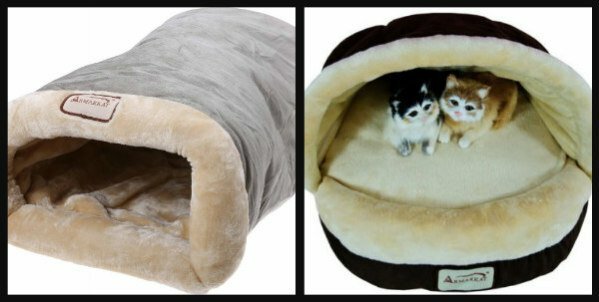 Milliard offers another pet cave that is more like a hooded pet bed than a cave or a pocket, but it's also gotten good reviews and could be used in a crate as well. This bed is machine washable and features a removable cushion. It's a good home-based model for pets that like to curl up in a snug, partially enclosed environment without being sandwiched between the covers. Armarkat's pet beds for snugglers also come in a range of shapes and sizes, which makes it easier to find what you're looking for when shopping for the nester in your life. 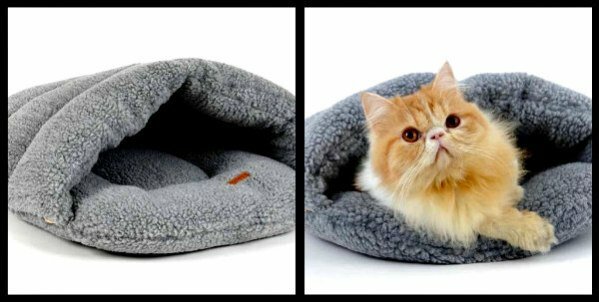 Their Burrow Pet Bed for Cats and Small Dogs is shaped like a sack that lies on its side. They're reminiscent of the brown paper grocery bags you used to bring home from the store only to have your cat knock them over and crawl inside for hours at a time. These are for animals that really like to burrow, not just curl up. Constructed from faux suede and faux fur they are machine washable. 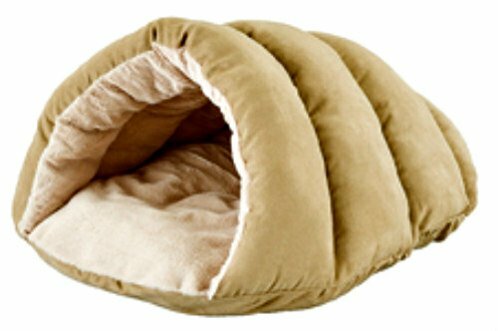 Armarkat also carries the more familiar pet caves covered here and pet beds similar to the Milliard hooded pet bed mentioned above. Like Snoozer, Armarkat has a huge selection of bedding and pet products to choose from along with a good reputation for customer satisfaction. 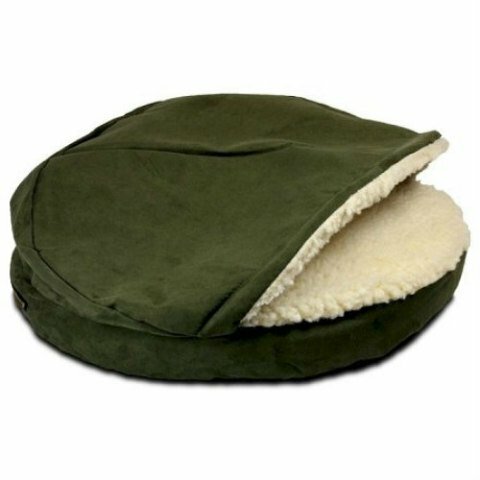 Some of these pet beds for snugglers look more like over-sized slippers or fuzzy pita pockets. That's the case with this pet sleeping bag bed for small animals by sellers Wild for Life. It's extremely well suited for burrowers and would work great in pet carriers. They come in gray or camel fleece and a gray plushy fur that also comes in pink. The medium pet sleeping bags are purported to support pets weighing up to 16.5 lbs. and the small just 6.6 lbs. Due to the extra thick materials involved in their construction they tend to run small, even with the generous dimensions listed in the descriptions. According to consumers, the small beds are more appropriate for guinea pigs, ferrets or very small cats and teacup dog breeds, so you may want to go up a size when you order. Both versions are machine washable and safe for dryers. On a side note, Snoozer carries an identical bed that must be produced by the same supplier, as each of them carry the Hoopet logo. Either way, Snoozer and Wild for Life have received positive feedback in relation to these nesting beds. While this Crinkle Sack bed is advertised for cats, it will work just as well for other small burrowing animals, as long as they don't mind noise. That's because there's been a layer of plastic added to the lining to make crinkling sounds. While it doesn't look as much like a brown paper bag lying on its side (like the Armarkat Burrow Pet Bed), it does make the noise of one. The interior is lined with lamb's wool Sherpa, and the outside is covered in a poly/cotton blend for easy washing. Cats and kittens will get the biggest kick out of this bed and will likely play and be amused by it for hours. Bottom line: another sack bed that would work well with on-the-go snugglers with an inclination toward burrowing. K&H also carries a lot of other pet beds, pet caves and assorted products too. The Aspen Kitty Cave is another pocket- or envelope-shaped bed that looks like you'd stuff pita ingredients into it. It kind of reminds you of one of those old change purses or sunglass cases that you squeeze the top and it springs open and shut. Having said that, it has gotten good reviews with customers looking for an inexpensive pet bed on a trial basis for nesting animals before they go out and spend more money. In other words, it's a great starter bed if you're not sure how well your pet will adapt to a burrowing bag. Covered in a solid poly/cotton mix fabric and lined with soft, mink-ribbed plush, it's a good-looking cave bed that would compliment a lot of decors. Unfortunately, it's only capable of being spot cleaned, so keep that in mind if you're thinking of ordering one. This bed is intended for small animals. 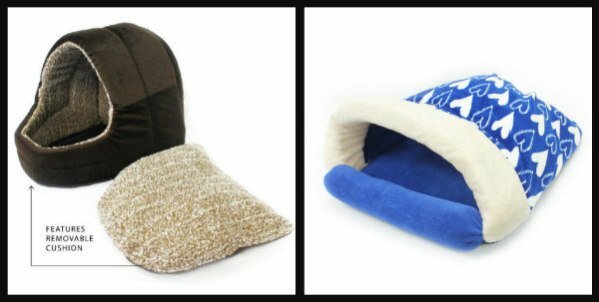 While there are literally dozens of manufacturers and sellers of pet bedding, these pet caves and snuggle sacks for nesters were chosen based on positive consumer feedback for quality, durability and pet satisfaction. Several of the vendors highlighted here offer many other options when it comes to animal beds, so don't get discouraged if you don't see what you want right away. 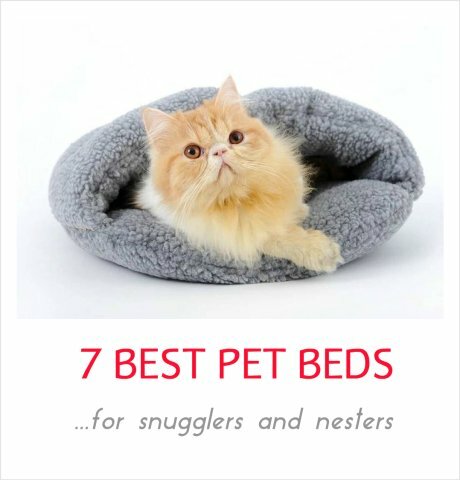 Have you tried any of the pet beds mentioned here? Is DogPause® The Answer To Some Dog Eating Disorders?